"Primate of All England" redirects here. For Primate of England, see Archbishop of York. From the time of Augustine until the 16th century, the archbishops of Canterbury were in full communion with the See of Rome and usually received the pallium from the Pope. During the English Reformation, the Church of England broke away from the authority of the Pope. Thomas Cranmer became the first holder of the office following the English Reformation in 1533, while Reginald Pole was the last Roman Catholic in the position, serving from 1556 to 1558 during the Counter-Reformation. In the Middle Ages there was considerable variation in the methods of nomination of the Archbishop of Canterbury and other bishops. 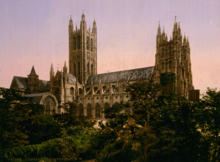 At various times the choice was made by the canons of Canterbury Cathedral, the Pope, or the King of England. Since the English Reformation, the Church of England has been more explicitly a state church and the choice is legally that of the Crown; today it is made by the reigning monarch on the advice of the British prime minister, who in turn receives a shortlist of two names from an ad hoc committee called the Crown Nominations Commission. The Archbishop of Canterbury and the Archbishop of York are both styled as "The Most Reverend"; retired archbishops are styled as "The Right Reverend". Archbishops are, by convention, appointed to the Privy Council and may, therefore, also use the style of "The Right Honourable" for life (unless they are later removed from the council). In formal documents, the Archbishop of Canterbury is referred to as "The Most Reverend Forenames, by Divine Providence Lord Archbishop of Canterbury, Primate of All England and Metropolitan". In debates in the House of Lords, the archbishop is referred to as "The Most Reverend Primate, the Archbishop of Canterbury". "The Right Honourable" is not used in either instance. He may also be formally addressed as "Your Grace"—or, more often these days, simply as "Archbishop", or "Father". Otford Palace: a medieval palace, rebuilt by Archbishop Warham c. 1515 and forfeited to the Crown by Thomas Cranmer in 1537. ^ "Announcement of the 105th Archbishop of Canterbury". Archbishop of Canterbury Website. 9 November 2012. Retrieved 14 November 2012. ^ Archbishop's Roles and Responsibilities Archived 14 February 2008 at the Wayback Machine, Archbishop of Canterbury website. Retrieved 8 February 2008. ^ "Register of Lords' interests". House of Lords. Archived from the original on 7 August 2007. Retrieved 15 August 2007. ^ "Archbishop installed as first Chancellor". Canterbury Christ Church University. 12 December 2005. Archived from the original on 28 September 2007. Retrieved 7 August 2008. ^ "The Presidents of Churches Together in England". Churches Together in England. Retrieved 23 February 2014. ^ Hickman, Baden (19 May 2000). "Lord Coggan of Canterbury". The Guardian. Retrieved 23 February 2014. ^ "Madrid Interfaith Dialogue Conference: Beginning of a Process". Saudi-US Relations Information Service. Archived from the original on 15 May 2010. Retrieved 6 May 2014. ^ Niles, D. Preman (1989). Resisting the threats to life: covenanting for justice, peace, and the integrity of creation. Geneva: WCC Publications. ISBN 9782825409640. ^ Wacher, J., The Towns of Roman Britain, Batsford, 1974, especially pp. 84–6. ^ Brooks, N., The Early History of the Church of Canterbury, Leicester University Press, 1984, pp. 3–14. ^ "Bekesborne Archbishops Palace" (26 July 2017). Gatehouse-Gazetteer.info. Retrieved 7 April 2019.